If it ain't broke, don't fix it. 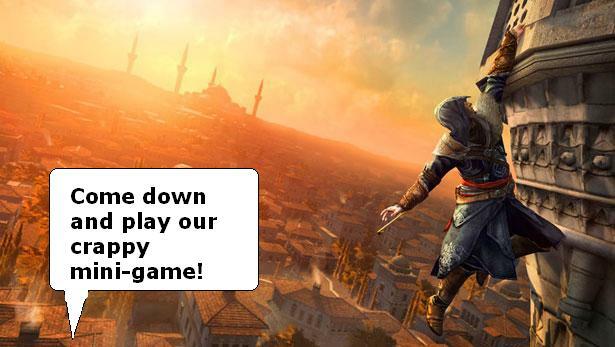 Certainly, the blokes at Ubisoft follow this rule - Assassin's Creed: Revelations is pretty much a reskin of the previous games, with a couple of bells and whistles cobbled onto the side (bombs and hooky-things are a nice addition, kudos) but the blood and guts look the same. And rightly so, it ain't broke. However, if something isn't broken - you certainly don't need to take something which IS broken and mash it to the side; hoping that it will grow some sort of symbiotic relationship and miraculously not be crap. Sandbox games are brilliant because you are allowed to roam wherever you like. 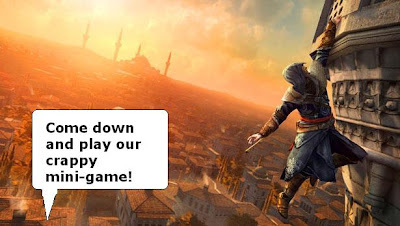 This is especially true with the 'screed series - if you want to climb that impossibly high tower and then throw yourself off the top, then go do-it to-it good buddy! However, what you DON'T need is the constant reminder to "Quick, stop whatever fun thing you're doing and come play our arduous tower-defense game which is super-duper clunky on the PS3 controller and takes fricken ages!" It's like the whiney girlfriends in GTA: San Andreas all over again. One of the things about Bethesda games is that feeling when you hit level 50 or so and no matter how high you bump that difficulty you seem to cut through nasties like a flaming Shish-ka-bob through guar-butter. I’m nearing that point at level 18 in Skyrim. I haven’t bumped the slider up by much yet, maybe about 10-15% since it started getting really easy. I’m hoping to crank it up to 100% difficulty before I start hitting max level on skills. My build of Heavy Armour + Block + One Handed Weapons + Enchanting + Smithing + Alchemy does make me rather overpowered. My exquisitely smithed heavy armour plate not stopping you? Oh well, I’ll pop a health potion. Casting fireballs, eh? Good job my armour is enchanted with magic resistance! Any weapon or armour I pick up can be almost immediately smithed into a “superior” or “exquisite” version – giving me greater damage/armour. I can then toddle off to Whiterun’s resident court-wizard, buy a grand soul gem and stick a fire enchantment or magic resistance on it for extra oomph. Admittedly, I do still struggle a little with mages. My orc, unlike my breton, doesn’t have any inherent magical resistance so has been toasted many a time, but I’m hoping that very soon I’ll be able to pick up the +50% elemental resistance with my shield raised perk and turn myself into a walking talking killing machine. Couple my suped-up gear with the vast number of stews I’ve cooked which gift me nearly infinite stamina and I can pretty much shield-bash my way through dungeons, laughing maniacally as eyeballs and spinal cords fly past my grizzled maw. Fus-Ro-Da’ing my merry way into the center of an angry bandit camp is particularly enjoyable – watching as their lifeless bodies clatter against their flimsily constructed log-walls – and nothing compares to the feeling of reacting to their cries of “I’ll get you!” and “this is the last mistake you’ll ever make!” by turning their heads into volleyballs with one swift swing of my blade and hurling them into a lake, still wearing their expression of confusion and regret. I think I had a point to this post, but got kind of lost in the gloriously bloody mess of it all. Unfortunately, my Blackberry suffered at the hands of the moisture caused by the running of a bath (it wasn’t dropped into the bath, mind, just in my pocket whilst I was running the water). Consequently, it has gone doo-lally and I am back to a standard, non-smart, phone for the next couple of months because I’ll be damned if I’m going to pay for a repair when my upgrade date is in January. The upshot is that I might be quiet on twitter/late at replying to emails for the next couple of months. Please forgive me *sadface*. 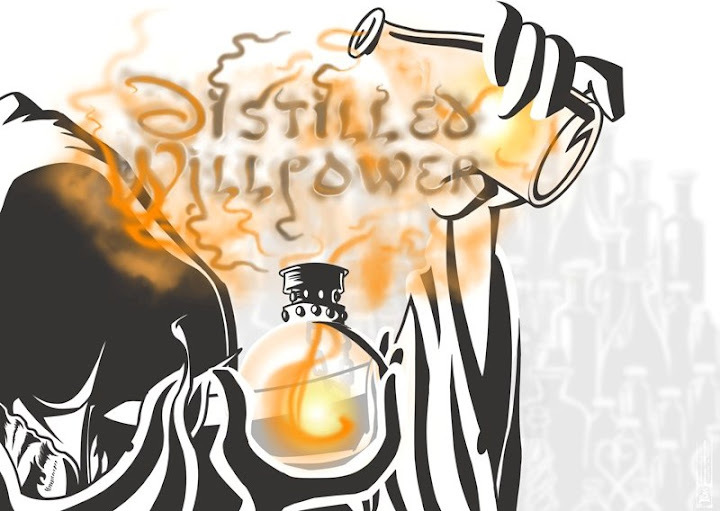 The following article was written for Distilled Willpower by Sara at Video Game Design Schools. Although Halloween has come and gone, it doesn’t mean you can’t get in some good scares. With horror making its way into everything from television series to comic books, video games are no exception. For those still craving a good scare while gaming, we have gathered the top ten horror games that can literally scare you away from your controller. Dead Space – Is “Aliens” your favorite horror movie? Even if it isn’t, fans of both horror and space will find loads of both thrills and chills in this game from Electronic Arts. Players must escape a giant spaceship in which aliens have possessed all the dead bodies. Resident Evil – There is a reason this video game franchise was made into a movie. Players often have to escape mansions, cities, and other areas that have been infested with zombies. It also stood out for being the first game in which zombies, rabid dogs, and other abominations leapt through windows to attack players. The best choice for horror is Resident Evil 4. Silent Hill – This is one of the first games geared specifically towards the horror genre. There are different versions but most have you sifting through a town of ghosts, zombies, and other baddies to find a missing loved one. There is even a version where the only light source you have is a simple flashlight. Left 4 Dead – Get more zombies galore in this game. The zombies themselves make for horrific scenes by doing what most enemies don’t: namely jumping, strangling, and even vomiting. There are also witches and other frightful moments in the game. F.E.A.R. – Proving that creepy kids aren’t just for movies like “The Ring” is this game. Alma is a little girl who haunts the world you must conquer in the game. There is also a sequel rumored to be scarier than the original. Doom – Although the game that spawned a movie starring The Rock can sound frightening, it wasn’t until the third incarnation came out that it became truly frightening. Because players are forced to hold either a gun or flashlight, not both, they often hear monsters before they see them or can even react to them. System Shock – Similar to Dead Space, this game is all about a haunted space ship, aliens, and more. However this game often involves artificial intelligence gone mad and even elements of role playing games. Amnesia – Sure any video game can have you battling monsters, but what if you can’t? That is the premise of this game in which the main character searches for clues to their missing memory. The game often calls for the player to hide from monsters or even barricade themselves. Dark Souls – Like to combine shooter games with horror? Then you won’t be disappointed here. With a game that has players lurk through sewers to find zombies, it can be more horrifying than you think. Limbo – Combine a love of horror and puzzles in this video game. A bit like the movie “Coraline,” a child escapes into a mystery world looking for their double/sister. In addition to scary scenes, there are also loads of puzzles to solve along the way. This article was written by Sara McDowell. She owns the site Video Game Design Schools List and is an avid Gamer. Remember, if you'd like to get involved and write me a guest post - just drop me an email! Previous guests posts can be found here. I’ve put together a few little tips I’ve picked up from my first *checks* OMG 28 hours, on Skyrim. The list is by no means exhaustive, so if you’d like to drop any of your own tips in the comments section I’d be much obliged! 1) If you are playing a character that uses a shield, utilise the Shield Bash attack. Hold down the block button and then hold the attack button to smash your shield in the face of the enemy. It interrupts attacks and spells – even on larger enemies such as dragons. At later stages, you can unlock a perk which slows time if you are blocking when an enemy power attacks – allowing you to smash them in the face, causing them to stagger and putting you on the front foot to unleash a barrage of power attacks and quick slices. Once you reach a rhythm you can cycle attacks, shouts and bashes to keep your foe constantly reeling. 2) Bind weapons and spells to your number keys. This is a feature which I feared hadn’t made the trip from Oblivion to Skyrim, until @KingStGreibach educated me. Oddly, you can only bind weapons from the favourites menu. So, hit F over an item in your inventory to add it to your favourites, then in your favourites menu, hit the number you wish to bind it to. It is useful for easily switching between spells, bows and melee weapons if you have a large and unwieldy favourites list like I do. Unfortunately, it can be a little difficult to juggle which items are going into which hand and it would be so much simpler if we could hit 1 on two different weapons to create a weapon set (waiting eagerly for the mod). I believe you can bind weapons to your D-pad on the consoles too. 3) Listen to your locks. Just as in Fallout 3, when you are playing the little lockpicking minigame the clunking and shifting sounds of the bolts isn’t random – there is a specific sound which is made when you hit the sweet spot. It sounds like all of the bolts shifting up at once, but not falling down again. That’s when you should turn. It takes time to learn, and it can be very frustrating, but eventually you’ll find that you can identify the correct spot pretty quickly and save yourself a lot of picks and time (and torn out hair). 4) Read the expensive books. There is several novels’ worth of literature in Skyrim, however, you can identify which tomes will rank up your skills by looking at their prices. Usually anything above about 20 gold will contain a nice little bump to one of your skills. That’s not to say you shouldn’t read the other, more budget-priced, books: some will start quest lines, others add map markers or give clues to the whereabouts of hidden treasure. 5) Use your Clairvoyance. I’ve found that one of the most useful spells to use is the Illusion spell “Clairvoyance” – especially in dark and winding caves where you can see the exit is somewhere west, but you’ve got 3 different paths you could potentially take. Cast this spell and a magical aura spreads out in front of you and snakes its way towards your destination. Even for a non-magical character this can be extremely useful especially in the early stages of the game. It may eat your magicka but you can cast it for just a couple of seconds to give yourself an idea of where to head next. 6) Stay rested. Resting in a bed before adventuring will give you the “Well rested” bonus and give you a boost to your exp gain. Plus, who likes adventuring in the dark - get to bed, fool! 7) Elemental magics have different effects. Fire magic deals the most base damage, and tends to cause the foe to burn for longer after the spell is cast. Ice drains stamina, and is good for stopping your enemy from unleashing power attacks. Lightning drains magicka, so is good for taking down mages. The same goes for elemental enchantments on weapons. 8) Finally, DO NOT shoot the chickens. You’ll have to pay a fine. Seriously. [ES5] Skyrim Review: Arnold Dracunegger! 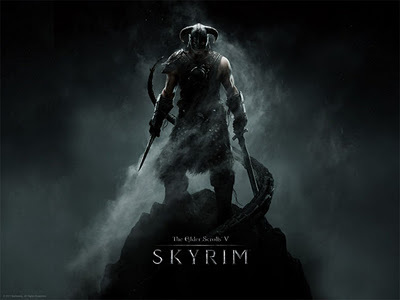 It's a little early for a proper review, but the amount of hours I've clocked on Skyrim since it plopped through my letterbox midday Friday kind of rules out me calling it a "first impressions" so here it is - my pseudoreview of Skyrim. Dragons. Of course. You can't go two steps this financial year without bumping into a knapsack full of dragons. Hey, can you pass me the salt? - oh, I'm sorry, there's a dragon in the way. Must be because of the Chinese new year. As usual, you are "the one". In fact, you turn out to be "the one" in a lot of senses. I'm working through a particular guild's storyline and it turns out that not only am I "the one" in terms of being the Dragonborne but I'm also "the one" in terms of being the only person to whom a particularly crispy dead lady will talk. The main story, so far at least, is fairly standard fantasy fare. Dragons bad, kill dragons, use your new found powers to find and kill big badass dragon. Game over. Well, I say that, I'm not actually far enough through the story to see if Bethesda have thrown in some insane plot twists. I've been far too distracted by the typically bewildering number of side-quests, dungeons, bandit holes, castles, forts, dwemer ruins and guild plots in which to get embroiled. In Skyrim, as soon as you walk through the city gates there is a scene being played out in front of you. When I entered one city I was witness to a brutal murder, another and I watched as two burly nords bullied a local dark elf, another and a traitor was being brutally beheaded. There is always something happening and something to do. Oblivion had much the same thing, although it felt a bit more structured - you always knew that every town would have a mages guild, fighters guild and a thieves guild, and there would be various little quests to pick up about town but usually you had to go looking for them. It was a little odd not to be directed straight towards a guild hall. I'd started a sneaky light armoured bowman so I knew I'd be straight off to join the thieves guild, but it was ages before I even knew how to find them and even when I did find out (on a tooltip during one of the loading screens) their base was in a far flung city and it took me a good half an hour to walk there (this was before I discovered the handy horse-and-cart fast travel system). When I eventually could start the thieves guild storyline I wasn't disappointed, I even got to a particularly spectacular part where, having battled with an invisible foe atop a gigantic statue of an elf, I had to find my way out of an Aladdin-esque cave of wonder as it quickly filled with water. And that wasn't even the final quest! When this amount of effort is put into what is essentially a side quest, you know you're on to a winner. By the way, with that last image - I'd avoid that area if I were you, unless you have an army in tow, of course. Nuff said. The audio, similarly, is fantastic. They've put together a really beautiful score and it adds to the whole ambiance of every dungeon, sweeping valley or murky castle hall. The ambient sound audio is also excellent, I hurry away from swinging blade traps because the swoosh and slice of those flying axes is almost deafening. I hear most enemies before I see them, particularly howling wolves and the cries of an angry dragon. I do have one small question though: where on earth did they get the accents for the nords from? You can be speaking to one guy and he will sound like Count Dracula whereas the next will be Arnold Schwarzenegger, one second you're talking to a guy with a Glaswegian bark and the next guy sounds like the Swedish chef from the muppets. It's not a bit issue, just amusing that they've managed to squeeze a linguistic span which traverses almost a whole continent into just one country. The combat in Skryim has been greatly improved over Oblivion. Magic and physical attacks can now be used simultaneously as you can add different weapons and items to each hand (ie, you could dual wield swords, or have a fire spell in your left and a dagger in your right, you can even dual wield different magic spells and combine their effects). It really adds a new element into designing your character - am I a noble sword and board paladin? Am I a crazy dual axe wielding orc beserker? Am I a wizened old mage with a staff and a lightning bolt spell? Personally I went for the "shoot you in the eye with an arrow from about a mile away and hide" route, and it works pretty well. They've also added in slo-mo killing moves, which add a whole new cinematic feel to close-combat. What is also quite nice to see is that they've made a concerted effort to introduce the puzzle element back into the game. Whilst, admittedly, most of your adventuring is going to hinge on your combat ability, there is plenty for the sneaky thieves and those who like a good puzzle to get their teeth into. The enhanced menu system really helps here, as you are able to open up your inventory and manipulate every single item in the game. This means that Bethesda can put little puzzles and clues onto an item if they wish - such as the image below (SPOILER btw!) where you have to examine the item in your inventory to learn the combination for the locked door. Leveling has changed a lot - every action you undertake increases a skill and each time you do this it gives a little exp towards your next level. With the new Fallout 3 style perk system I really look forward to every level I'm able to attain. It adds a nice little bonus for the work you've put in. Plus, with a couple of the perks I've picked up, it means I can slow down time like in the Matrix! Swwweeeeeeettt! It's a beautiful game and if you were thinking about getting it then my opinions won't sway you in the matter at all. In fact, from what I can gather almost every person on the planet has a copy of this game by now: my Steam friends list was jam packed with people playing it over the weekend (I myself have almost hit 24 hours which is both depressing and inspiring in almost equal measure). When I got to Friday evening (having clocked in a good few hours by then) I was starting to question whether Bethesda had made any real advancements from Oblivion, but having played it like a crazed crack addict since then, I can confirm that Skyrim outstrips its predecessor by quite a way and the differences become more apparent the longer you play. Graphics are sharper, audio is richer, gameplay and combat is more varied and interesting, and whilst the plot seems fairly fantasy-standard there are so many side-plots that you will be engaged for months. In many ways its is familiar fare for Elder Scrolls veterans, but it adds so many little tweaks and unusual little changes that you can't help but consume it like Brian Blessed at a wedding reception buffet. Since I started this whole game-blogging lark there has been one thing which has bugged me. I anticipate every hot release, I read up on every game I’m interested in, watch videos, write blog articles and interact with the community. This process has a whole cavalcade (yes, “cavalcade”) of advantages in terms of being prepared for the game, knowing what to do once I get in and maximising my game play right from lift-off and being able to interact with an identifiable community such as you lovely people. I have intentionally avoided information on the new Elder Scrolls game. I played Morrowind and Oblivion in a similar way – although I went into the games unintentionally blind. The previous games were so fun because I stepped into the world totally unjaded; with no real agenda, no compunction (yes, “compunction”) to see this place first or fight this monster above all others. I went into the game much as the character went into the game – blinking at the sunlight, fresh off the slave ship and naked but for rags and manacles. It was exciting. I discovered things at the same time as my character and at no point did I have to feign surprise so as not to hurt his feelings. In Morrowind, when I ventured into the vampire strongholds I felt true trepidation, genuinely unaware of what I might find. In Oblivion when I swam across the clear blue lake and stepped into that first Aylied ruin on the beach, I had no idea what was inside (turns out it was full of bandits with cracker-esque armour so thin you could have spread cream cheese on it and chomped it down with slices of apple and grapes). Naturally, there are certain elements of Skyrim which I couldn’t avoid. I know the dragon battles are unscripted. I know you can dual wield weapons/magic etc. I know it has a funky new inventory screen with full 3D renders of every item. I know that there will be an annoying Wood Elf in the starting area who I will later come back and slaughter. Other than that, I’m going in blind. And I’d like to keep it that way. So, when the game arrives tomorrow (the British postal system willing) I shall don my 5.1 surround sound headphones and shut the world off – if only for one day. After that I’ll come back to the real world, I promise. But for those first few hours I am going to feel the cold wind in my bristles, hear the crunch of snow underfoot and smell the stench of charred flesh. Tomorrow – for just a couple of hours, I’m going to be a goddamn Nord. The second in my flashback series takes me all the way back to 19th November 2010. Alternative Reality Games were a real passion of mine, and I know my interest in them lies dormant somewhere inside my psyche still. I moved away from talking about them on my blog, simply because I felt that I was trying to stretch my subject too thinly and in the long run it wouldn't have worked. But that doesn't mean I can't revisit the time every so often. So, enjoy!